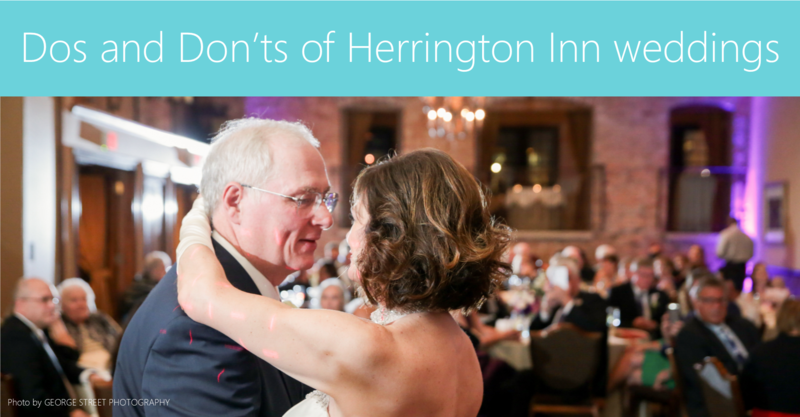 There's a right way and a wrong way to throw a Herrington Inn wedding. Of course, the same could be said of any wedding venue - but this boutique Geneva, Illinois venue is literally across the road from Backthird's office, and just as charming as they come. We're partial to seeing as many successful events there as possible. 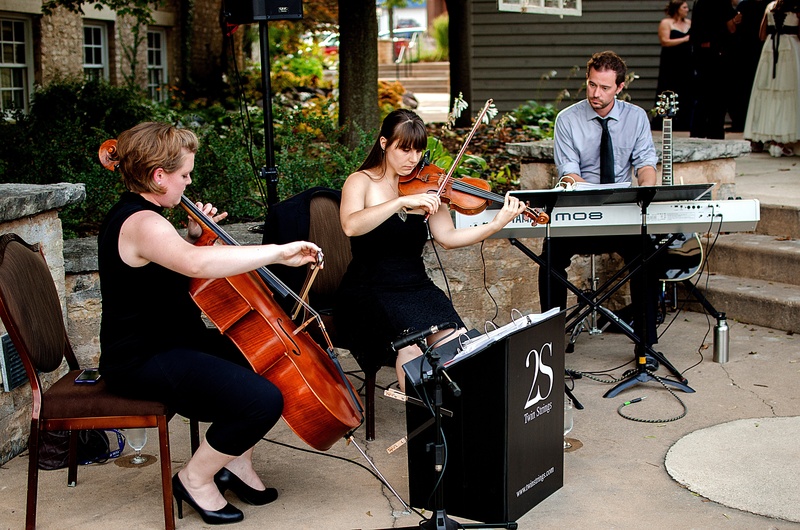 Our musicians and DJs have been working weddings at the Herrington Inn since 2005. Here are a few tips from the Backthird team to make planning your wedding there easy. The Rock Springs room and the River Room are kind of the same room. If your party has more than 100 guests, you'll likely be using both - enjoying cocktail hour in the upstairs Rock Springs space, then heading down to the River Room for dinner, then moving back up again for dinner. If you've been to the Herrington, you know that's not as awkward as it sounds - in fact, it's a pretty perfect way to break up your reception. Open up the gorgeous "balcony" windows that connect the upper space to the lower one, and guests will feel like they're still all at one party. Many couples even use these windows for their introductions. Have your DJ stand in a side window to welcome guests and introduce you, then make your appearance in the central window, and wave like royalty before you head downstairs to join guests for the meal. 2. ...but DON'T spread out unnecessarily. If you'll have fewer than 100 guests at your wedding, make the most of that intimacy - and hold both dinner and dancing in the same space, the Herrington's lower River Room. 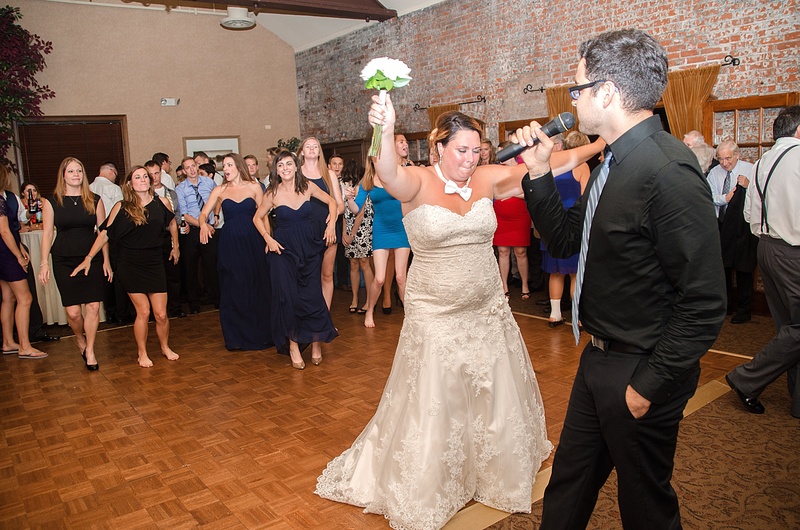 Smaller parties work better in smaller spaces, and your guests will have a front-row seat for special dances and events like the one pictured above. 3. DO get outdoors if you can. When the weather's nice, the Herrington's back courtyard is an incredible space for either an outdoor wedding ceremony or a cocktail hour - or both. 4. ... but DON'T move furniture or music equipment between spaces. At Backthird we include the sound setup we know you'll need in every Herrington Inn wedding quote we write - it's automagical. But if you're booking with another DJ or music group, make sure your entertainers have enough equipment on hand to transition from inside to out. Especially in the Herrington's intimate reception spaces, you don't want to see a DJ or sound engineer hauling speakers from your cocktail space to the dinner room in the middle of your reception. And neither do your guests. 5. DO have a transition plan with your DJ for when dancing begins. Your DJ doesn't just help write your agenda - she also helps you sell it. If you'll be moving guests from downstairs to upstairs when it's time to dance, that means having a plan for how to make that happen with class and grace. There are as many ways to pull this off as there are DJs and wedding couples. Sometimes a simple announcement like "the dance floor is open upstairs" is all it will take. But other crowds are more shy - your guests might need an excuse, like your first dance or another special event, to get them upstairs for that moment when the dance floor opens. After that, it's seldom a problem getting - and keeping - the dance floor going all night. You DJ will have some ideas on how to make this transition work best - don't be afraid to ask. 6. DON'T be afraid to ask advice. My DJs and musicians have been working with the same great staff at the Herrington since Backthird opened for business 15 years ago! This is a venue with low turnover, and that bodes well for your wedding. Why? No one knows the ins and outs of Herrington Inn weddings better than Deanne and her team. That's why I recommend you take the advice of your event staff when it's time to pick a final floor plan and a schedule for your day. They know what works. And when you're ready to finesse that schedule and guide your guests through it, DON'T ignore your DJ's advice either. Especially if he or she has a lot of Herrington event experience.